Sip beverages while enjoying a slice of Sin City's bright past. Enjoy the Neon Boneyard by night while raising a cocktail to the cool 'n bright past of The Strip. The Neon Museum throws a Vegas-style cocktail party on Sept. 18. COSMIC COCKTAILS... night at the sign-filled institution, and the Las Vegas Astronomical Society is joining in and hauling along a bevy of telescopes. First things first: Guests shall watch the sun set, and then, as the stars pop out, there shall be a lot of looking upward at various planets and stars. A DJ "spinning cosmic music" will be on hand, and food and drink options will be in-the-house and on-the-plates (and in-the-cups) as well. Tickets? They're seventy five bucks a person, and they help out the Neon Museum in all of its sign-saving, public program ways. Pairing up signage and sipping? It's a very Vegas tradition. 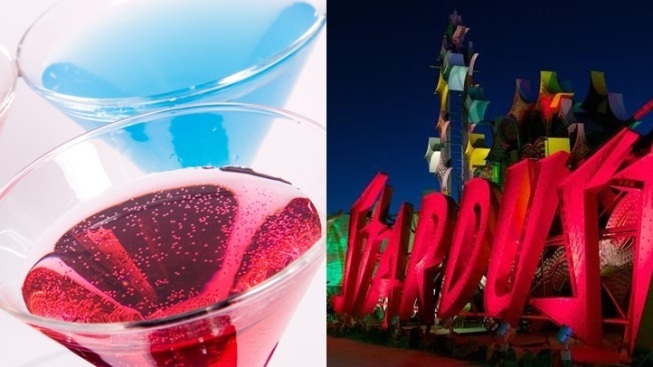 If you have designs on calling upon Sin City over that weekend, a cocktail in the Neon Boneyard, with some astronomy love as the cherry on the cake, could be an offbeat to-do, and yet one with plenty of way-cool Vegas history, universe-inspired knowledge, and a flavorful bite/sip, too.